New Delhi, Jan 9: Sporadic incidents of violence in West Bengal and Kerala and rail blockades in certain states were witnessed Wednesday on the second day of Bharat Bandh, which also saw a partial disruption of banking and insurance services across the country. 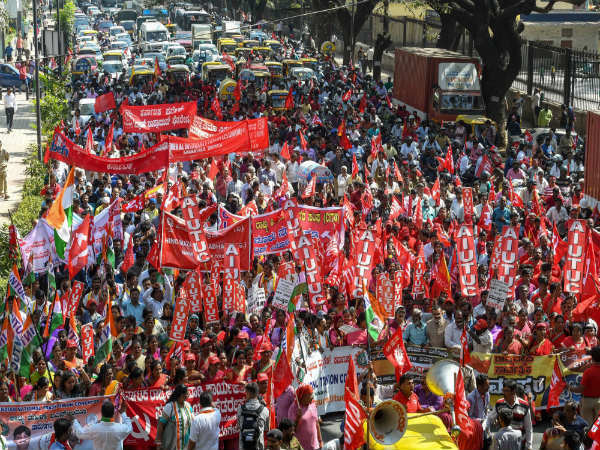 Other sectors like mining, road transport, power supply too bore the brunt of strike call given by country's 10 major central trade unions, except RSS affiliate Bharatiya Mazdoor Sangh, to protest against the government's alleged anti-labour policies and unilateral labour reforms. They had given a call for a two-day Bharat Bandh on January 8 and 9. Tamil Nadu | Trains were stopped by protesters at a few places in Tamil Nadu during the second day of the two-day nationwide stir called by 10 central trade unions. In Chennai, protests were held at Mount Road and Perambur and Guindy railway stations. Delhi - trade unions march from Mandi House now - united colours of trade union flags challenging the Modi Govt's assault on workers rights! Karnataka: According to TV reports, protesters forcefully entered school in Bagalkot and took teachers to task for not sending midday meal workers to take part in the protest. Bandh in Odisha: According to reports, train services were hit on the second day of the strike in Odisha as trade union activists staged 'rail roko' at several places including Bhubaneswar, Balasore and Berhampur. Former Karnataka CM Siddaramaiah supports Trade Unions' strike, says their demands are justified. He says," All trade unions except BJP affiliated unions took part in the protest. Trade unions' protests are not sponsored by Congress." Bihar’s Rashtriya Janata Dal, Samajwadi Party, Hindustani Awam Morcha & Left parties participated on the second-day of strike called by Central Trade Unions demanding minimum wages and social security schemes among others. Banking services were partially affected for the second day Wednesday, as a section of PSU bank employees came in support of the nation-wide strike call given by 10 central trade unions against the alleged anti-labour policies of the government. All India Bank Employees' Association (AIBEA) and Bank Employees' Federation of India (BEFI) have supported the strike, which has impacted banking operation where these two unions are strong. Bengaluru: Factory workers and members of Centre of Indian Trade Unions (CITU) raise slogans during a 48-hour-long nationwide general strike called by central trade unions in protest against the "anti-people'' policies of the Centre. Sujan Chakraborty along with other protestors were detained by police while participating in the two-day nationwide strike called by Central Trade Unions demanding minimum wages and social security schemes among others. Karnataka: All the government buses in Karnataka’s Gadag district have been completely stopped after the bus drivers’ association decided not to work on the second day of Bharat Bandh. CPI leader Doulat Kuri said they will stop the buses if they start working again. Kerala: The SBI treasury branch near the government secretariat in Thiruvananthapuram was attacked by strike supporters. The branch manager was manhandled and his room was vandalised.Following the incident, police protection has been given . After Tuesday’s police firing in Tripura, mobile internet services have been suspended to stop propagation of fake messages through WhatsApp and other social media platforms like Facebook, YouTube, and Twitter. The para-military force also held a flag march in the affected areas of Madhabbari, in West Tripura. West Bengal: The suspected bombs found near Habra’s Ashoknagar in West Bengal has been disposed of by civil authorities as of 10.25 AM. Normal services resumed over the Bangaon section after the bombs were cleared. All India Trade Union Congress General Secretary Amarjeet Kaur has said that there will be a complete bandh in Goa and Bihar, while 100 per cent strike is expected in other parts of the country too. Farming communities, through their associations, have also extended support to the strike. Student and teacher organisations of various universities have also declared support. Meanwhile, public transport in West Bengal, Maharashtra, Karnataka and Kerala remain disrupted. West Bengal: Two students injured after protestors participating in the two-day nationwide strike called by Central Trade Unions demanding minimum wages and social security schemes among others, pelt stones at a bus at Shanpur Mor on Jhikira-Howrah route. Kerala: Rail Roko protests continue across Kerala on the second day of the trade union's strike. The Kerala State Road Transport Corporation incurred a tentative revenue loss of 5.40 crores on the first day of strike after 4,504 schedules were cancelled. Karnataka: Stone pelting incidences occurred in and around Bangalore in the wee hours of the morning. 12 KSRTC buses were attacked near Wilson garden, Nelamangala road, Mysore road, Audugodi and Madanayakanahalli. West Bengal: State govt directs bus drivers to wear helmet while driving, in view of nationwide strike called by Central Trade Unions demanding minimum wages, social security schemes & against privatisation of public and government sector. Strike by Brihanmumbai Electricity Supply and Transport(BEST) bus employees over their demands including fixation at master grade of employees employed after 2007,merging BEST budget with ‘A’ budget of BMC & resolving the issue of employee service residences, continues today. The All India Bank Employees Association (AIBEA) and Bank Employees Federation of India has informed the Indian Banks' Association (IBA) of the two-day nationwide strike on January 8-9, 2019, IDBI Bank said in a filing to the BSE. Kerala State Road Transport Corporation (KSRTC) cancelled 4,504 schedules as the Central Trade Unions went on a two-day nationwide strike. A tentative revenue loss of 5.40 crores is calculated by the corporation and services of 18.21 lakh kilometres were cancelled on the first day of strike..
Banking and transport services are likely to inconvenience the public today as the all-India strike by trade unions enters its second and final day.